A few years ago, BlackOut was invited to help develop and market an exciting community development initiative, Rediscover Scranton. We’ve remained involved with the program and recently we had an opportunity to reflect upon how much Rediscover Scranton has grown during a refresh of our initial site design. Rediscover Scranton is an initiative to promote the Greater Scranton area and its educational, cultural and business assets to professionals with ties to the area. 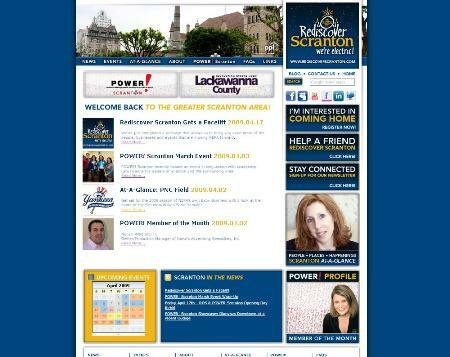 They came to us looking for a site refresh that gave greater access to the full range of news they provide on the people, places and businesses that make up the Greater Scranton area. The new site design would also incorporate a BlackOut-designed blog, as well as information on their new partnership with POWER! Scranton. POWER! Scranton is one of Northeastern Pennsylvania’s leading networking and social organizations for young professionals so the partnership with Rediscover Scranton was a natural fit. Check out the results of BlackOut’s work at Rediscover Scranton or the Rediscover Scranton blog.